Prior to the arrival of the railroad, Newtons industries supported the agricultural interests of the surrounding countryside. Such industry as existed was confined to processing local products of nature, specifically wood, grain, fruit, and animal skins. Samuel and John Johnson manufactured a fine quality of brick from 1813 to at least 1816 at a kiln on the east side of Division Street, between the Main Street and Linwood Annex. About that same time, a brick kiln operated on Doctor John R. Stuarts farm on lower Spring Street. A few years later, an excellent quality of brick was made on Major Pettits farm on Mill Street, near the edge of town. Jacob Wintermute, of Lafayette, revived the industry in January 1854 using clay from Edward C. Moores meadow, near the Stone Bridge on Water Street. Allen Ridgeway commenced brick manufacture on the meadows in 1866. In April 1881, O. B. Wintermute built drying sheds at his brickyards on the meadows, adjoining the Fairgrounds, with the intention of starting to manufacture bricks. He sold the Newton Brick Yard to Abram Losee and his son, E. Franklin Losee, in August 1883. The picture above shows Frank Losee at his mule-drawn pug mill, mixing clay and sand. David Kerr, Jr., operated a hat factory at the corner of Church Street and Linwood Annex from 1815 to 1832, employing between 20 and 40 laborers. He formed a partnership with John J. Van Deren in December 1815. David Kerr built the Kerr-Stinson at 76-78 High Street in 1823. Stephen Day purchased the hat factory in 1832. John Trusdell commenced the manufacture of flag-bottom chairs on Mill Street. The chair factory burned on January 4, 1835 and he relocated to William A. Baldwins leather store, near the corner of the Newton Green. John Trusdell, Jr. sold the business to Francis B. Topping. In September 1828, Predmore & Baldwin took charge of the Raynor chairmaking and sign painting shop. The flags were harvested from the meadows beyond the baseball field in Memory Park. In August 1823, George W. Richards opened a spinning wheel and chair shop on the present site of the old Woodward Hardware Store on Main Street. Ladner Trusdell started his chair factory on the corner of Main and Division Streets in May 1833, but later moved to a wooden building on Park Place. The chair industry lasted from 1825 to 1875. John Waterman and Dilman Daub operated a bewery on the stream running in the hollow north of High Street from 1803 to 1815. They owned the property (now 53 High Street) from March 1810 through August 1812. Their brewery consumed local harvets of barley, hops and cord wood in the manufacture of beer. John Waterman continued brewing in Newton until 1821. Dilman Daub died at Hardwick in February 1822. In June 1824, Benjamin Cridland & Company opened a brewery on Water Street. Matthias F. Baldwin started a large tannery on Mill Street. He removed to Newark and leased the tanyard to Ephraim Green, Jr., in November 1826. Matthias son William A. Baldwin purchased it in March 1832. He relocated to Newark in April 1836. 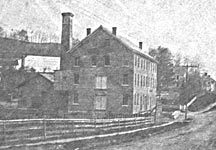 James R. Hull purchased the Baldwin tannery in May 1838. Hides brought from the surrounding countryside were tanned in immense vats. The hides used in boot making required six months to cure. Large stacks of hemlock bark were piled around the tannery for grinding. The Hulls currying shop, selling finished leather, was located on the northeast side of Mill Street. 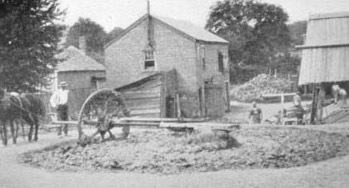 The original tannery with its vats, bark mill and heaps of spent tan was located between the Hull Homestead and the building to the north. The tannery burned in 1865. The Schedule of the Products of Industry included in the 1850 Federal Census provides an excellent overview of local industries. According to this survey, James R. Hull operated a tanyard that consumed 125 cords of bark in tanning 2,000 leather sides of skins and 500 skins. James A. Stackhouse was a tanner and currier who used 40 cords of wood annually in processing 500 leather sides of skin. These tanyards provided the leather products used by local shoe, boot, saddle and harness makers. The annual production of Elias Blackwell, harness maker on Church Street, was recorded in 1850 as 20 sets of single harness, 20 sets of double harness, and 100 collars and trimmings. David L. Foster, shoe maker on High Street, used 320 pounds of skins, hides, leather and trimmings to produce 73 pairs of boots and 150 pairs of shoes. In all, eight men were employed in tanyards, harness or shoe shops. Various branches of woodworking employed nine men in 1850. John Kraber, a cabinet maker who came to Newton in 1834, used a total of 8,000 feet of pine, cherry and walnut in 1850 to manufacture 40 tables, 30 bedsteads, 6 bureaus and 2 sofas. John C. Williams used 3,000 feet of maple and walnut to make 50 bedsteads, 20 tables, 30 stands and bureaus. Ladner Trusdell, chairmaker, used 10,000 rounds, 3,000 slats and 600 bundles of rush to produce 400 Common chairs, 400 Cottage chairs and 200 Fancy chairs. Elias Hathaway, cooper, transformed 3,500 hoop poles and 12,000 staves and heading into 500 firkins, 700 barrels and 25 churns. Newton also boasted two tinsmiths: Lyman Edward and John W. Lane. Daniel Baker, Marble Cutter, used 300 feet of Italian marble and 600 feet of American marble to fashion 100 headstones and one monument. Without any natural water power, industrial development depended upon rail-transported coal for steam engines. 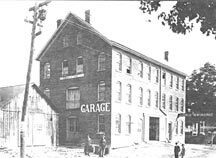 John W. Lane and Samuel H. Bodine opened the Sussex Foundry at 189 Spring Street in June 1854, manufacturing stoves and plough shares. Edward C. Moore purchased this foundry at public sale in August 1859 for $7,100. The Sussex Foundry building burned on July 7, 1865, destroying the office and printing plant of the New Jersey Herald. Ex-Sheriff James Smith erected a brick edifice of large dimensions on the property at 189 Spring Street in August 1868. By 1870, he operated his sash, blind and spoke factory at this location. The Merriam Shoe Factory was built on Sparta Avenue in 1873. A stock company was incorporated in 1882 and the business grew rapidly. In October 1929, the H. W. Merriam Shoe Company merged with a Baltimore manufacturer and closed their Newton facility. The Jefferson Shoe Company moved to the Sparta Avenue factory from Brooklyn. In 1931, they shared their plant with the New Jersey Brush Manufacturing Company and the Newton Carton Company. In June 1936, the Merriam sold a portion of the old factory to the North American fur Dressing and Dyeing Corporation. Another portion was sold to dry-cleaners Jacques and Maurice Glass in April 1944. See separate page. 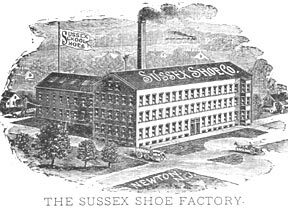 Robert Brennan, Edward L. White and Ira C. Moore organized the Sussex Shoe Company in 1886. On February 1, 1886, they commenced operations in the old Steam Gristmill on Mill Street. John Huston and Ira C. Moore bought the company in 1890 and made a substantial enlargement to the factory in 1891. Lacking ready cash to meet its creditors demands, the Sussex Shoe Company fell into receivership on December 20, 1900. The plant then had a daily capacity of making 1,100 pairs of shoes with a fortnightly payroll of $2,500. The H. W. Merriam Shoe Company purchased it on December 26, 1901 and operated the facility as Factory B. In 1910, the Merriam Shoe Company consolidated its operations in its original Sparta Avenue factory, making a large addition. On October 1, 1915, the Mill Street factory sold to the Standard Towel Company. The Standard Towel Works were enlarged in September 1916 by an addition, 20 by 80 feet, to its dye house. Thomas F. Farrell received the contract for a brick addition with a ceiling height of 20 feet. The chimney in the center of the building, which was abandoned when the new boiler room was erected in 1915, was to be removed as the space was needed for manufacturing purposes. There were 76 looms in constant operation, requiring the service of 70 skilled operators. The payroll averaged $600 weekly. In November 1916, Standard Towel received a large order from the largest retail establishment in New York, while the national government placed a $19,000 order. The Newton Laundry Corporation purchased the factory in December 1927 and occupied the basement level. W. W. Woodward continued to lease the street-level second story for storage of Buick cars. 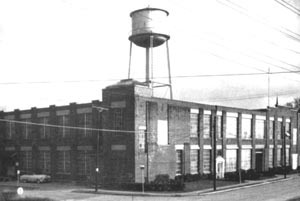 Jersey Distillers purchased the Laundry Building on Mill Street in September 1933 and applied for a Federal license to manufacture apple jack, peach and pear brandy, using local fruit. The Acme Feed Store opened in the former towel factory in January 1935. Edgar Douglas, president of the Newton Chamber of Commerce, started a drive to raise $500 to defray the cost of moving machinery so that a New Brunswick manufacturer of pants and slacks can occupy the sweater factory of Mill Street. The building was demolished after a fire in 1969. The site of the old gristmill and shoe factory has been occupied by the tower apartments on Mill Street since 1974. McEwen Brothers, of Whippany, started a paper box factory at 181 Spring Street to supply the local shoe factories. George H. Savacool purchased the business in November 1888. At that time, six girls and two boys were employed in making 1,000 to 1,500 boxes per day. Each box manufactured at the plant had a printed label attached to it; these labels were printed on the premises. Mr. Savacool installed a patent box machine and a five-horsepower Greenfield engine and boiler in March 1894. By 1896, twelve girls and four men were engaged in making 4,000 boxes daily. George H. Emmons built his residence on Clinton Street in 1887. He started a florist business there in 1892, specializing in growing roses, carnations and bedding plants for the New York market. John Farrell patented the design for a novel hay fork in 1883 and manufactured them for a time on his farm in Green Township, using steel frames forged in Pittsburgh. On March 31, 1893, John Huston and Andrew Van Blarcom sold the house at the corner of Madison and Halsted Streets, formerly owned by Elijah Rosenkrans, to John Farrell of Andover Township for $3,500. Martin Ryerson had erected the dwelling on this lot for Allen Rosenkrans in 1857. Contractor Simeon S. Cook built John F. Farrells Hay Fork Manufactory, 130 by 50 feet, two stories in height, on Madison Street in January 1894. A blowing forge and trip hammer were added to the factory, enabling Mr. Farrell to forge the steel frames into shape. By June 1895, Mr. Farrell was employing fifteen men and had recently added an addition to his plant. He had also purchased the adjoining house and lot at the corner of Hasted and Madison Streets, on the rear of which he erected his sawing house, while storing his lumber on the rear of the lot. Power was furnished by a twenty-horsepower engine and boiler. On June 24, 1895, Mr. Farrell commenced the manufacture of 3,000 peach baskets per day, employing about fifteen boys. Will Farrell returned from a sojourn in the South in January 1903 and formed a partnership with his father, John Farrell, at their machine shop. New and improved machinery was added and a specialty made of automobile repairs. Thomas W. Bentley was born in Bradford, Yorkshire, England, on February 7, 1861. His parents brought him to Paterson when he was eleven years old. He started his training in the silk industry with the firm of Doherty & Wadsworth. In 1885, he founded the Thomas W. Bentley Silk Company. From this firm, he and David Valentine developed the Sterling Silk Company, which grew successively into the Valentine & Bentley Silk Company, and the Bentley & Twohey Silk Corporation of New York. Thomas Bentley moved to Newton in 1899. He broke ground for his stone mansion at the corner of Main and Halstead Streets in April 1901. Leonard Breen, of Paterson, received the contract to build the Sterling Silk Mill on October 24, 1895. The original silk mill, two stories high, measuring 210 by 50 feet, contained 580,000 bricks. Twenty bricklayers were employed, laying 20,000 bricks daily; the building in all. The roof was made of Newton slate. The inside of its brick walls were whitewashed and windows occupied nearly half of the wall space. White shades softened the natural light, allowing operators to see fine patterns printed on the silk. A fireproof stairway, silk vault and engine room were located outside the main building. The plant was powered by a 130-horsepower Corliss engine and 150-horsepower boiler. David Valentine brought some skilled employees with him to instruct beginners. The new mill made only plain silks until the operatives became proficient enough to make figured silks. In Paterson, the company employed three women for every man. After coming from the loom, the silk was picked and measured in an office on the first floor. Machines for winding, warping, doubling and filling were also located on the first floor. The second floor contained the silk looms. A dozen skilled weavers were brought to Newton to instruct beginners in their operation. The first loom started operation on May 15, 1896. The silks were woven in a gray or natural color and fully of a gummy substance; they were originally shipped to Paterson in this condition for cleaning to make the silk soft and pliable. Designs were then printed on in different colors. The entire process was eventually conducted in the Newton mill. The Silk Mill Annex, 206 by 198 feet, built of brick, one story high, was completed in March 1899 to house 400 looms. Its sawtooth roof contained skylights of double glass with a ventilator at the bottom of each. This allowed the delicate shades of color to be more easily discerned. There were no windows, except on the northwest side which was seldom exposed to direct sunlight. The floor was built to shut out dampness with underlying layers of sand, coal tar and cinders. Steam pipes were embedded in the double floor. The interior walls had two coats of whitewash and the ceiling was whitened by three coats of paint. A dynamo in the engine room supplied electricity to light the building and to run the looms. Bathrooms were located outside the building. Ten new box looms and twenty plain ones were immediately installed in the new Annex. The company planned to move all their looms from the main plant and to increase their number to 400. The silk weavers went on strike on January 31, 1900. Five days later, the Newton Board of Trade decided that the strike was unwise and unjustified. Strikers returned to work on February 22, 1900. The Sterling Silk Company changed its name to the Valentine & Bentley Silk Company on July 10, 1900. A Dye House, 41 by 100 feet, was constructed on the side of the weaving shed in November 1900. The building contract, filed with the Sussex County Clerk on October 31, 1900, contained a clause that specified: If William McKinley is not elected President and Theodore Roosevelt is not elected Vice-President of the United States at the coming election, this contract shall become null and void. Fortunately for the contractors, the Republicans won. In July 1902, another contract was awarded for an addition to the Dye House, 100 by 50 feet. Valentine & Bentley gave the H. G. Vogel Company, of New York, a contract in April 1905 to install an automatic fire extinguishing system for $8,000. Contractors ODonnell & McManiman received the contract to build a bid addition, 50 by 110 feet, to the silk mill. The Valentine & Bentley Silk Mill was reorganized as the Sussex Print Works under management of Thomas Bentley & Son on September 25, 1911. Herbert Bentley was president and general manager. In 1913, H. T. Rounds joined the firm and was elected president. Mr. Bentley served as vice-president and treasurer. Thomas W. Bentley became the exclusive owner of the Valentine & Bentley Silk Company on June 3, 1916. A week later, the firms name became the Bentley & Twohey Silk Company with all production designed and made under the personal supervision of Thomas W. Bentley at the mills and John J. Twohey at the New York salesroom. Their mills at Newton, Phillipsburg and Pittston, Pennsylvania, manufactured dress silks, high-class novelties and fashionable plain weaves. The new company officers were: John J. Twohey, president; Thomas W. Bentley, treasurer; and Daniel B. Bentley, secretary. After a strike kept several silk mills in northern New Jersey closed for several months, the Bentley & Twohey mill was re-opened in July 1920. In August 1923, the Sussex Print Works opened their new factory at Andover Junction, which was to be operated in conjunction with their Newton plant. Thomas Bentley moved to New York in 1923, where his wife, Isabella O. Brown, died in 1926. He married Ella C. Beveridge, of Scotland, in 1928 and retired to his residence on Park Avenue, Paterson. In 1927, the Sussex Print Works was a leader in the manufacture of the new fabric called Celanese. Thomas Bentleys eldest son, Herbert Bentley, died July 30, 1931, at 47 years of age. The Fabrics Finishing Corporation of Newton sold its machinery, plant and business to the Associated Dyeing & Printing Company in March 1931 for $225,000. The Bentley Mansion on Halstead and Main Streets, Newton, became Lodge No. 1512, Brotherhood of the Paternal Order of Elks (BPOE), in November 1932. Thomas W. Bentley died October 29, 1932. The Sussex Print Works closed for a time in October 1933. 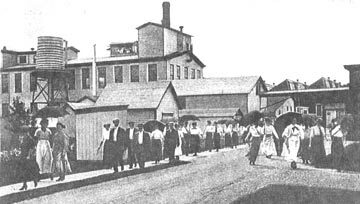 A walk out by 220 Newton workers, members of Local 29, Federation of Dyers, Finishers, Printers and Bleachers of America, forced the closure of the Sussex Dye and Print Works on September 28, 1945. At that time, Bernard Armour operated the plant. Work resumed on October 10, 1945, after workers were granted a raise. The Sussex Dye and Print Works closed in 1950. The Silk Mill, Annex and Dye House were demolished in 1993. Hopkins & Williams opened their feed, coal and lumber business in 1896. They erected a large planing mill on Diller Avenue in 1898. George A. Williams took over the business in April 1904. He specialized in the manufacture of window and door screens. The company merged with Milliken-Kellam Company, of New York, in January 1912. Its directors were: John P. Milliken, Clinton W. Kellam, W. Polhemus, Hugh Murray and Levi Howell Morris. The Milliken-Kellam Company leased their plant at 20 Diller Avenue to the Columbia Ice Box and Furniture Company, of New York, in January 1919. The new firm was expected to employ between 30 and 50 laborers. Sam and Charles Stogel incorporated the Columbia Ice Box and Furniture Company in July 1920. They purchased the property in September 1922 and commenced construction of bungalows for their employees on the surrounding land. The Newton Shoe Company built a three-story brick factory, 50 by 100 feet, on Clinton Street in 1897. A Backus gas engine of 30 horsepower drove the machinery. The company officers were: Frank M. Hough, president and treasurer; Joseph H. Valentine, secretary; T. J. Richard, business manager. The company closed operations on June 21, 1902. In 1905 the Duplex Radiator Company took over the plant for the manufacture of gas heaters, but lasted only two years. In November 1905, Moser & Wacker, of New York, announced their plans to locate their silk embroidery company in the Newton Shoe Company building under the management of Jacob Hermann. A brick extension, 51 by 26 feet, was added in 1910. At that time, a 75-horsepower engine and 50-horsepower boiler were installed to provide sufficient power and heat. The new apparatus also ran two dynamos which supplied electricity to 450 lights. Six embroidery shuttle machines, 10 yards long, operated on the first floor. An operator working a tracer on a pattern (six times the size of the figure to be embroidered) guided mechanical needle bars, each containing as many as 680 needles. Besides rolls of cloth, the factory also embroidered ladies collars and medallions for ladies waists. A tracer, a woman watching the threads for problems and a shuttle girl tended each machine. Machines also wound bobbins. Collar patterns were given out a piece work to home workers. Four hand-powered embroidery machines were located on the second floor. Twenty-five employees worked at the embroidery works in 1910. Jacob Hermann became sole owner of the Newton Embroidery Works in 1916 through purchase of the half interest of Moses & Wacker of New York. Martin Ward was born in Newton on December 10, 1873, a son of Martin Ward and Mary Crotty Ward. He was employed for fifteen years as superintendent of Henry Merriams conservatory, but opened his own business in 1901. Martin Ward & Son completed their fifth florist building at 15 Foster Street in 1922. Martin Ward, Jr., died at his residence at 94 Main Street on April 13, 1941. The Century Milk Company purchased a tract of land from Henry C. Kelsey in May 1901, situated on the east side of Railroad avenue, near the stone crushing plant. Contractors ODonnell & McManiman built a two-story model creamery, 91 by 55 feet, at a cost of $25,000. Randolph H. Kissel, of Morristown, was president and William W. Wright, of Binghampton, New York, was manager. On December 26, 1901, the Sussex Register said the creamery was located on Railroad avenue, just back of Hart & Iliff lumber yard. It was described as a large one and conveniently located for receiving and shipping. Milk was received on the second floor where samples were taken. It was weighed and then dumped in a vat. After straining, the milk passed into another vat with a capacity of 200 gallons. From there, the milk passed over an aerator and cooler, at a temperature of 35 degrees, and thence to another vat from which it was taken to the cooling room where it was held at temperatures ranging from 21 to 26 degrees while awaiting shipment. There was a Farrington cream ripener in the butter room, together with a Simplex churn and butter worker and a refrigerated room. No natural ice was used; the cooling process being supplied by an engine and tank with a capacity of ten tons of ice daily. The large tank was filled with brine and with ammonia and the rooms were kept at the desired temperatures ranging between 10 and 20 degrees as the ammonia condensed in the coils on the roof and then recirculated to the machine. In May 1902, the Newark Milk and Cream Company engaged contractors ODonnell & McManiman to build a new two-story creamery, 33 by 103 feet, on a lot across from the Newton Depot. In May 1904, the Century Milk Company was sold to the Dairy Pure Food Products, of New York, but remained under the same management. George H. Ihnkin, of the Ideal Dairy Company of Brooklyn, purchased the Newton creamery for $5,200 at bankruptcy sale in March 1912. The Newton creamery closed in June 1935. The creamery of the Newton Milk Company at 253 Spring Street was damaged by fire in August 1939. Demka Broda and Moses Compton formed a partnership in the manufacture of peach baskets at Brodas shop on Water Street in May 1894. Broda built an industrial building at 62 Water Street in 1899, locating his cooperage and woodworking shop on the ground floor. He opened the first automotive garage there in Sussex County in 1903. In 1900 Morey & LaRue Laundry Company opened a branch steam laundry on the top floor of the new Broda Building. In June 1907, William H. Mellor moved a the Standard Towel Company into the Broda Building at 62 Water Street, giving employment to six people. Contracts were already signed to provide cotton toweling to major New York department stores. Manager C. Arthur Boss purchased the Sussex Steam Laundry in January 1910 and employed H. M. Pierson as manager. The company employed nine people. Demka Broda & George Emmons dissolved their partnership on October 1, 1910, with Demka Broda continuing the garage business. In April 1916, Demka Broda had a force of carpenters busily engaged in converting the stable building on his Clinton Street property into a dwelling house. He also made the necessary alterations at his garage to open more storage space for automobiles, adding a larger building in the adjoining meadow site in 1917. Broda first sold Elmores, then Maxwells, and finally Chryslers. Demka Broda & Atwood B. Koyt dissolved their partnership in the auto dealership in April 1920 with Demka Broda continuing at the old stand. In April 1920, the Wear Well Shoe Company of New York moved seven truck loads of machinery into the Broda building and started manufacturing. Renamed the Veribest Shoe Company, the firm commenced manufacturing on May 1, 1920, completing 7,000 pairs of shoes begun in its New York factory. Samuel H. Mulwitz, of Harrison, became owner in February 1922 and Hyman Friedman was named manager. The Broda Industrial Building was twice damaged by fire: once on April 28, 1921 and again on December 21, 1922. Since the walls were not impaired, Demka Broda repaired the structure. In October 1922, Demka Broda, proprietor of the Newton Garage, built an addition, 20 by 40 feet, in the rear for a workshop and commenced another addition, 40 by 80 feet, facing Water Street, for an automobile showroom. At that time, A. Albert purchased Samuel Mulwitzs interest in the A & M Shoe Company and resumed operations. Demka Broda sold his car dealership to Charles Snook in April 1926. Snook operated a Chrysler agency there. James Smith & Son purchased Brodas automobile show room in July 1960. In July 1900, the Newton Board of Trade reached agreement with Gustave C. Gennert to establish a plant in Newton for the manufacture of photographic supplies. The company erected a building on the Newton-Sparta Road in 1901 After laying idle for two years, the plant re-opened in 1908 under the original ownership but with Mr. Longdon as manager. The company specialized in a particular kind of photographic paper. Masonry contractors ODonnell & McManiman and carpenter Thomas Farrell built an addition to the Sussex Photo Supply plant in March 1910. In October 1916, Gustave Gennert, owner of the Sussex Photo Supply Company, awarded a contract to the Milliken-Kellam Company for the erection of a building, 30 by 138 feet; an extension 12 by 30 feet, and a vestibule entrance 5 by 8 feet, on their extensive property on Sparta Avenue. The foundation was to be made of concrete; the walls and partitions of hollow tile; the ceiling of composition board; and the roof of asbestos shingles. The cost of the additions and improvements was $5,000. Elijah Blackwell opened a new Slate Quarry on his premises about a half mile from Newton in December 1859. R. R. William was superintendent. In May 1861, John Harkin advertised the opening of the great slate quarry at Newton, located on Love Lane and known as the old Democratic Platform ground. In April 1871, the property of the Newton Slate Company was sold to Robert Ramedeu, who commenced to work it on a large scale. On April 12, 1900, Hopkins & Williams incorporated the New Jersey Slate Company with a capital stock of $50,000 to renew quarry operations on Love Lane [West End Avenue]. In May 1901, a boiler weighing eight tons was delivered at the Newton slate quarries on a wagon constructed especially for that purpose. George A. Williams disposed of his interest in October 1901. The Newton Slate Company was reorganized in 1905, employing six men. Frances Alba DeCosta and D. Charles Knapp purchased the Newton Slate Quarry in September 1920. 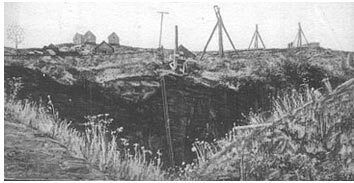 Specialist Burnet S. Oser, of Pen Argyl, began dismantling the machinery of the Newton Slate quarry on West End Avenue in May 1923. The Newton Slate Corporation executed a trust mortgage to the Harrison National Bank, of New York, under which it was authorized to issue $100,000 in ten-year 7% bonds. By June, a new mill building was being constructed for grinding slate into granules for manufacturing purposes, enabling the owners to utilize 300,000 tons of slate previously quarried but considered valueless because of flaws. Edson B. Knapp purchased the Slate Quarry property at Sheriffs Sale in July 1930 for $204. In March 1919, the Newton Board of Trade secured $25,000 in loan subscriptions and a $10,000 mortgage from the Newton Trust Company to finance construction of a new factory to be occupied by Mazuy Mills, manufacturers of corset cloth, who had offices in Manhattan and two mills in Paterson. The new plant of brick and glass construction, 250 by 50 feet, was expected to cost $59,000 to build. The construction contract was awarded in May 1919 to Salmond Brothers, of Arlington, New Jersey. A location at the intersection of Clinton and Mill Streets was chosen. Newton contractor William Houghton completed a large addition to Mazuy Mills in November 1926. The firm merged with Darlington Fabrics in 1930, forming the Darlington Fabrics Corporation under the presidency of Norman Schloss. The Darlington Mills Mutual Benefit Association, formerly Mazuy Mills, held a dance in February 1930 in the new addition to Darlington Mills. By 1940, the plant employed 370 operatives and 460 looms (both Jacquard and Dobby) in the manufacture of corset fabrics, shoe cloth and material for bathing suits. In May 1941, the new plant of the Darlington Fabrics Corporation included the first unit of a new type of automatic loom and certain auxiliary winding and warping equipment. The factory was doing pioneer work in the development of rubber yarns and weaving elastic fabric. George K. Campbell opened a factory on Paterson Avenue in June 1940 and the Town obtained deeds of right-of-way for the new street.